Last year First Niagara ousted its CEO, John Koelmel, who had overseen the bank’s rapid expansion and, subsequently, the rapid decline of its stock price. Koelmel, according to a post-mortem of his banking career published in the Buffalo News, was just too engaged in the civic life of the region to do a decent job of managing the bank. The article suggested that “the hallmark of Koelmel’s hubris” was his decision to buy the naming rights for HSBC Arena at a cost of over $1 million a year. This raised the profile of the bank in the region, but apparently not enough to ward off a recent $1.1 billion goodwill impairment charge, which is typically associated with a decline in a company’s brand value. The charge led the bank to declare a major loss in the third quarter of this year. The name change may not have been so great for First Niagara, but it seems to have worked out well for Koelmel. In the process, he appears to have cozied up to the latest initiates into Buffalo’s coterie of billionaires, Terry and Kim Pegula, who had purchased the Sabres prior to the re-naming. After his departure from First Niagara, Koelmel landed a job as president of HarborCenter Development, the company behind the Pegulas’ new $172 million hockey and entertainment complex. This may seem like a big step down for the former CEO of a major bank, but if you need to hitch yourself to a new source of capital—and capital is usually a prerequisite for a civic profile like Koelmel’s—a billionaire on the rise is not a bad option. When business magnates suffer the embarrassment of being tossed aside by the companies they run, they typically lose some of the prestigious positions that they acquired along the way. This was not the case with Koelmel, and the Pegula connection may have had something to do with it. He remains chairman of the New York Power Authority (NYPA), one of the most powerful and wealthy public authorities in the state. He remains chairman of Kaleida Health, the largest healthcare provider in the region. He is a board member at Great Lakes Health System, an odd umbrella group for UB, Kaleida, and ECMC. He is a member of the Western New York Regional Development Council, which is overseeing the Buffalo Billion. And he is a board member at the Buffalo Niagara Medical Campus, which is driving that favorite project of the local power elite. And so a failed bank CEO remains one of the most powerful and well-connected people in Buffalo. Forget about six degrees—most influential people in the region are either on a board with Koelmel or are one step removed. All this coziness creates some awkward situations. For instance, NYPA, where Koelmel is chairman, funds business startup competition 43North, which recently announced that it is moving to the Buffalo Niagara Medical Campus, where Koelmel is a board member, and which is also host to Kaleida, where Koelmel is chairman, and which also receives NYPA grants. 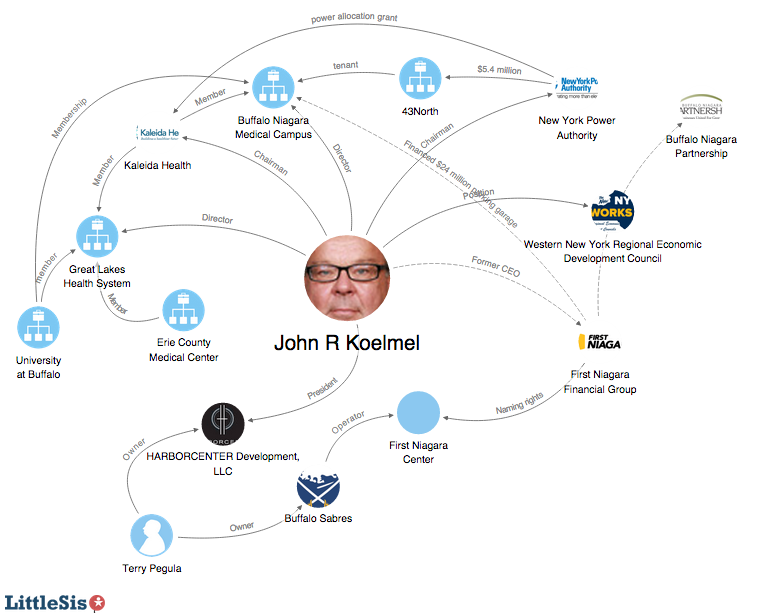 These sorts of relationships are sometimes described as “conflicts of interest” and sometimes described as “business as usual.” In any case, Koelmel’s ties to both NYPA and BNMC did not stop him from lauding 43North’s move to BNMC in a recent press release. “The plans to locate an incubator space at BNMC,” he said, “will establish the most favorable conditions for the success of the finalist companies emerging from the 43North competition.” The press release did not note that Koelmel is especially aware of the conditions at the medical campus, given his oversight roles at both BNMC and Kaleida. The consummate dealmaker seems to be comfortable on both sides of a deal. We could go on. And we probably will. LittleSis.org (the opposite of “Big Brother”) tracks information on power networks in Buffalo and throughout the United States. The above map was produced with Oligrapher, the LittleSis mapping tool. Have a Buffalo power tip for us? 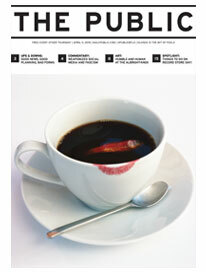 Email tips@littlesis.org.